When we last heard of the violinist Alejandra Torres, she was heard supporting the Colombian contrabass guitarist bassist extraordinaire Juan Garcia-Herreros, better known as the ‘Snow Owl’, but she was almost always in the supporting cast, although she was brought forward to solo occasionally. Listeners will not have heard of Miss Torres in a bold new lead role such as she is heard here on Renacer; certainly not beginning to play such devilishly complex music as “A tus ojos” a Colombian (folkloric) pasillo fiestero played in such an unusual minor key that it is a remarkably bold manner in which to open this album. And as if this were not enough, Alejandra Torres follows that song up with “El Tiempo” a skipping Colombian bambuco, lending to the memorable piece, her powerful lyric mezzo-soprano. 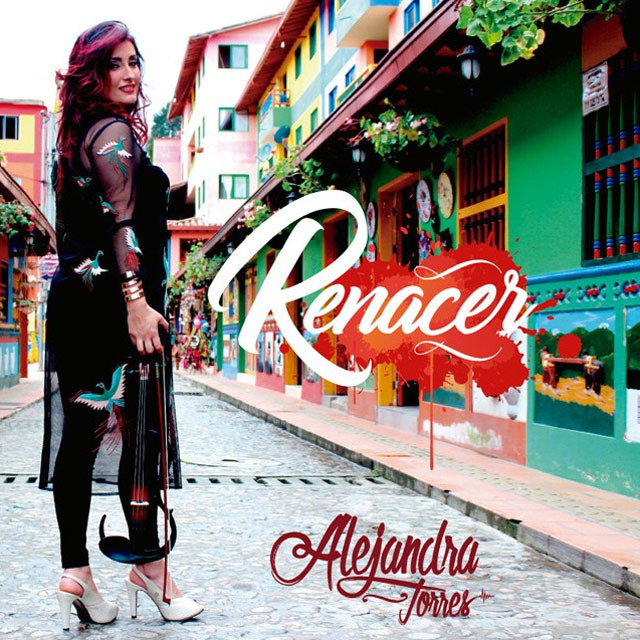 Surprises abound on Renacer and these have to do not only with the fact this is the maiden outing for Alejandra Torres as leader or that she turns on her gleaming voice to back – even lead – her violin, but that she is, in fact, a virtuoso of extraordinary depth and charm. At the end of “Improvisación al Verano” Miss Torres will be heard to have improvised a fantasy with such brilliance, one is fairly sure that one has not heard playing of such facility before. She plays the piece (and, for that matter, others too) with her fingers but a hair’s breadth from the bridge that there was hardly room for the bow. Not long after, on “Jazzeando en el Llano”, Miss Torres seems to play not just double-stops, but on all four strings at breakneck speed – a feat in itself even for the most brilliant virtuoso – and with such metrical abruptness and crispness that it lifts the composer and violinist above most of her contemporaries. However, speed and unequalled mastery of technique are not the only attractive attributes of this music. The nobility of Miss Torres’ playing also experienced in the slower, more meditative songs, such as the irresistible “Amor eres”. Her playing here displays a winning flair throughout, especially in the measured slower movement of the piece, every bit as lyrical as their faster predecessors their astringent modulations will make them vibrantly fresh for audiences of her music. As is to be expected when repertoire is steeped in the colourful, dancing Colombian folkloric music, the imagination with which Alejandra Torres manipulates rhythm, combined with timbre to achieve each effect is crucial to the success of this music – including with bouncy alternation of quavers and semi-quavers, which gives this music a continuous sense of forward momentum. Throughout the recording, one is also aware of the masterful performances by the musicians who have accompanied Alejandra Torres on this journey, one surely fraught with nerves and doubt, but eventually a journey that ends – as the music tells us – in the throes of unbridled ecstasy and artistic perfection, no less. Track list: 1: A tus ojos (pasillo fiestero, Colombia); 2: El Tiempo (bambuco, Colombia); 3: Improvisación al Verano (improvisación); 4: El Catre (onda nueva, Venezuela); 5: Renacer; 6: Jazzeando en el Llano (joropo Venezolano); 7: Amor eres 8: El Dorado (bambuco caucano, Colombia); 9: Danzón de la noche (danzón). Personnel: Alejandra Torres: violín, voice, composer and producer; Robert Quintero: drums, multiple percussion and co-producer; Günter Brück: piano, composer and producer; Petr Herbert: contrabass.